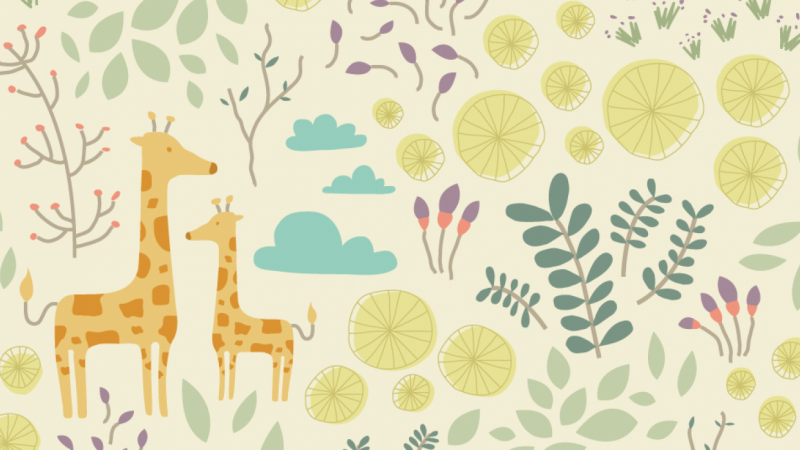 A giraffe was born recently at a zoo by my house (Detroit Zoo), and I decided to make this the theme for my pattern. For inspiration, I looked for things that are relevant to giraffes' lives. I researched their eating habits and searched for photographs of leaves, berries, and flowers that are common in their diet. For lack of a stylus, I doodled in my sketchbook first and digitized my doodles on the computer from pictures of my sketches. There were many vectors that I decided to omit because they competed too much with all the other elements. After a lot of tweaking, I finally finished my Earthy, flowery, leafy, pastel-y pattern. I ended up making a light pattern and a dark pattern because the different background colors made them look so different. Thank you, Elizabeth, for this wonderful and entertaining class! I've always wanted to make patterns but never knew where or how to start. I definitely see a lot of pattern designing in my future - they are so fun and rewarding to make!